Today we had a cooking lesson planned before heading off back to Narita for our flight to Seoul in South Korea! Our lesson didn't start until 11:00, and we had allocated the time before to send our luggage to Koriyama. However, as Jetstar had left Kate's bag behind at the Gold Coast, and as what remained was suitable for carry on between us, we instead just had a late breakfast and slowly made our way to Jimbocho station. If I remember correctly we stashed our luggage in one of the lockers upon arrival, though we might have also left it at the hotel or another station. We arrived pretty early and waited at the entrance to one of the stations exits as instructed. A few other non-Japanese couples soon joined us, and right on time a lady came up to us and introduced herself as Ayuko. 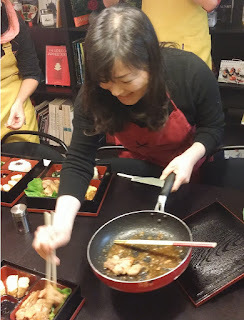 We had decided to do another cooking class in Japan after having so much fun last year at the Uzuki Cooking Class in Kyoto. The one is called Buddha Bellies, which is a bit of a tacky name but there you go. The location was very close to the station exit, we didn't have to walk at all! The room was quite small and also served as a bit of a library; full of books about Japanese cooking. The class is in English with a small group of people, less than nine, and you can choose from a variety of different courses. Well, you can if you're the first to book for that session. 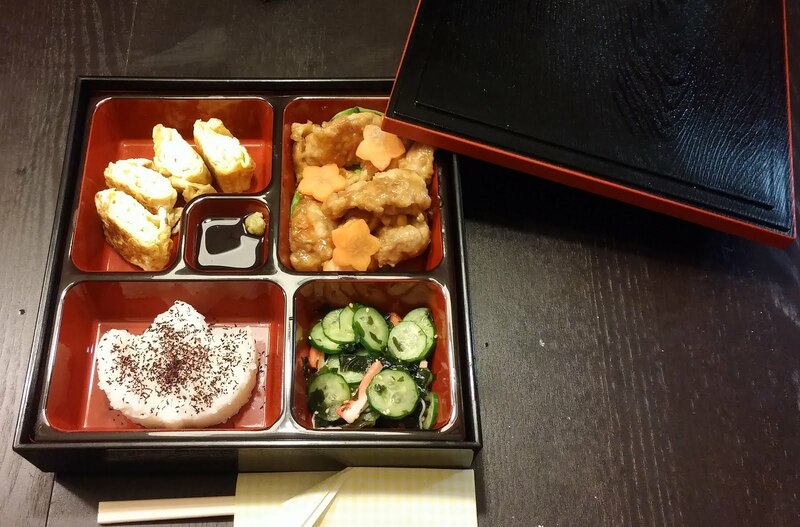 As we were in fact the first, we picked that Japanese Bento Box option. Also on offer was Nabe, Sushi, Sukiyaki, a vegetarian course, and more. 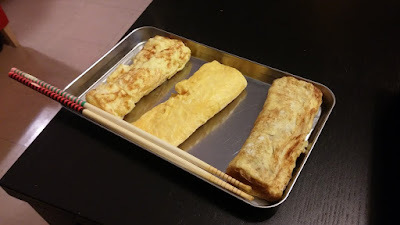 The trickiest thing to make was definitely the Japanese omelet which is something quite different from the western version. 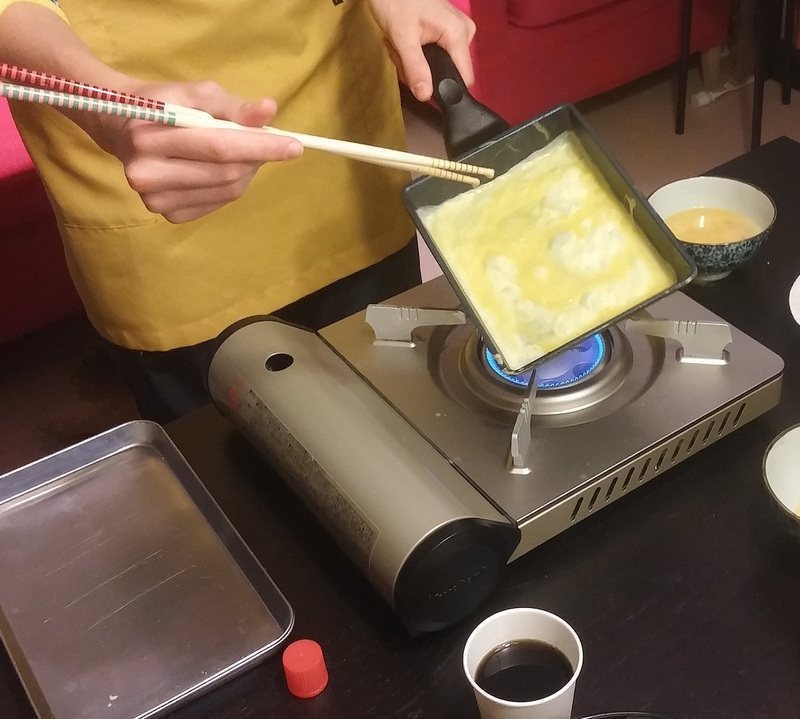 It's a lot sweeter as you add sugar, and is made by cooking and rolling thin layers of egg into a roll. 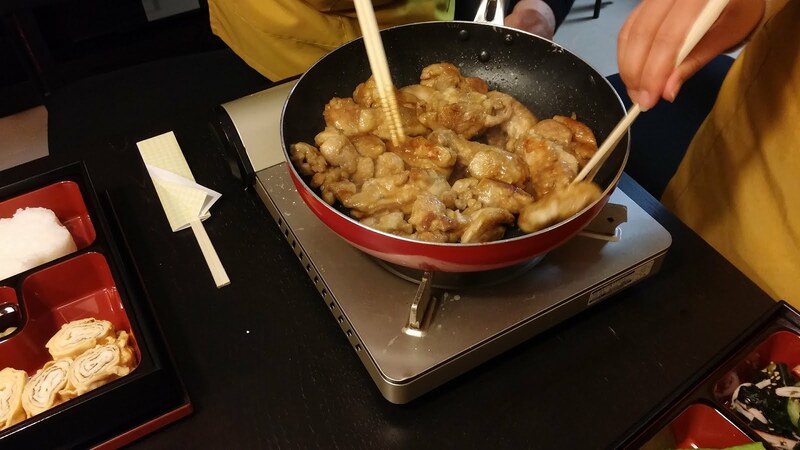 There's a special rectangular pan you use to cook it and it's very tricky! The layers are thin so it can burn or break easily, and if you fail at one layer it messes up the whole roll. I had a fair amount of trouble rolling the layers and getting the completed omelette out of the pan! In addition to the omelet we also learnt how to cook some tasty glazed fried chicken as well as a cucumber salad. We also had rice in our bento box, this was prepared earlier, though we did get to use cookie cutter style implements to shape our rice, and also added some flavouring. Once we'd finished cooking we garnished and filled up a large bento box with our food and took some photos. After that it was time to enjoy our meal! For our beverage we were given the option of beer, sake (nihonshu), or tea, most people went with the beer but Kate and I choose the sake and we both chose a different bottle from the three options so we could taste both. 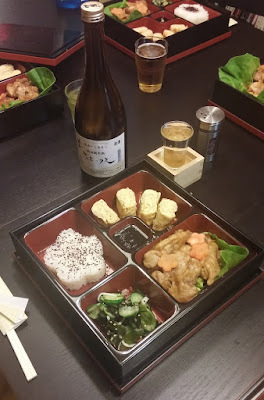 Both the meals and the sake were delicious! 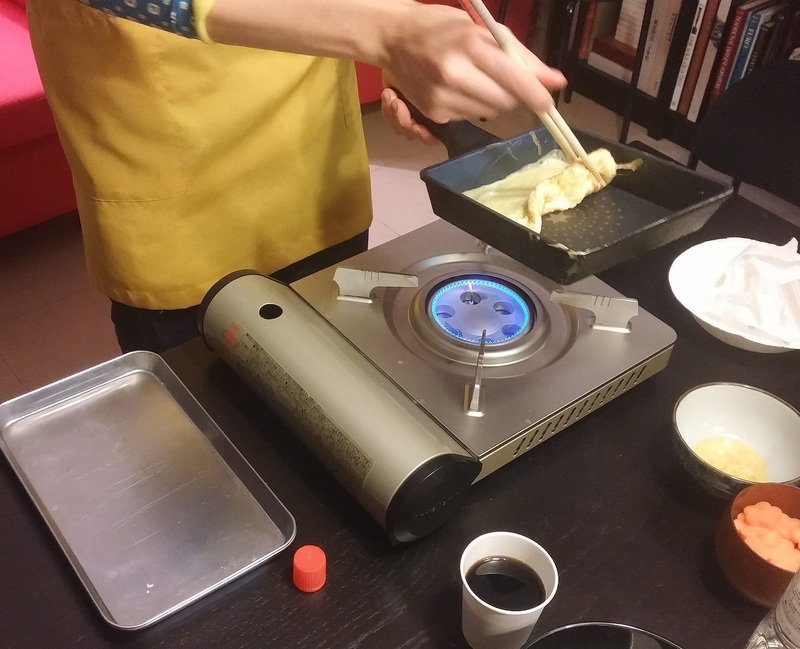 We had a great time cooking and I recommend the experience! After finishing our meal, receiving some chopsticks as a present, and paying, we went down to have a look around Jimbocho as our flight to Korea wasn't until 18:30. Jimbocho is Tokyo's largest used bookstore district and is also nearby a long street selling all sorts of musical instruments. We wandered around for a bit and randomly had a look in one of the stores. It was interesting inside; there were seven levels and each floor was dedicated to specific hobbies. There was a whole floor of trains, mostly books but also lots of models. 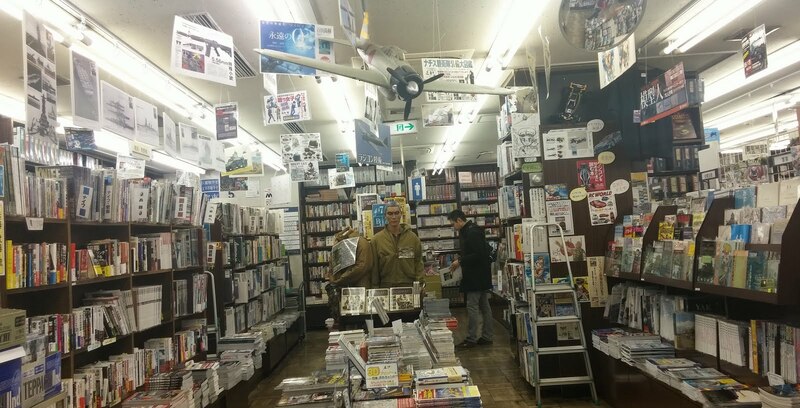 The amount of different books and magazines, and the level of specialisation was amazing. On other levels there were also big sections on military, cars, buses, motorbikes, history, religion, games, sports and idols. After finishing our look around we returned to the station, retrieved our luggage from somewhere, and caught a train back out to Narita Airport Terminal 2. As we were not in any sort of hurry we just used one of the slower, cheaper trains instead of any of the limited express options. We tried to get the cheapest flights we could to Seoul and paid around $200 return with Jeju air which is a South Korean low cost carrier (LCC). The check-in counter was in a separate area from the other airlines, and most people waiting were Korean; we were the only westerners for some reason. The check-in process was pretty smooth and we were able to skip the long lines as we only had carry-on luggage. Our boarding time was heavily emphasised by the lady who checked us in and she even wrote on our pass in thick red crayon that there was a strict deadline 10 minutes after boarding time started. 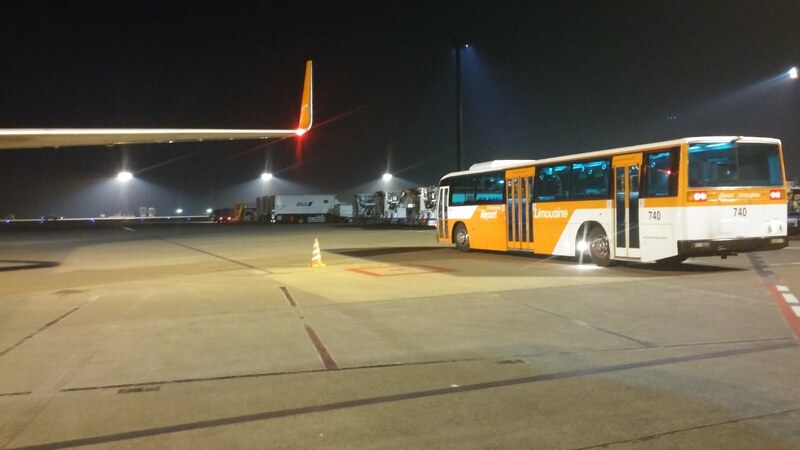 Our gate was 70H, and there was no plane waiting for us, even when it was time to board! 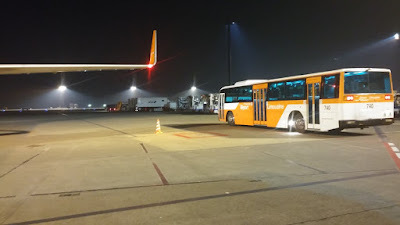 Instead we found a couple of buses! 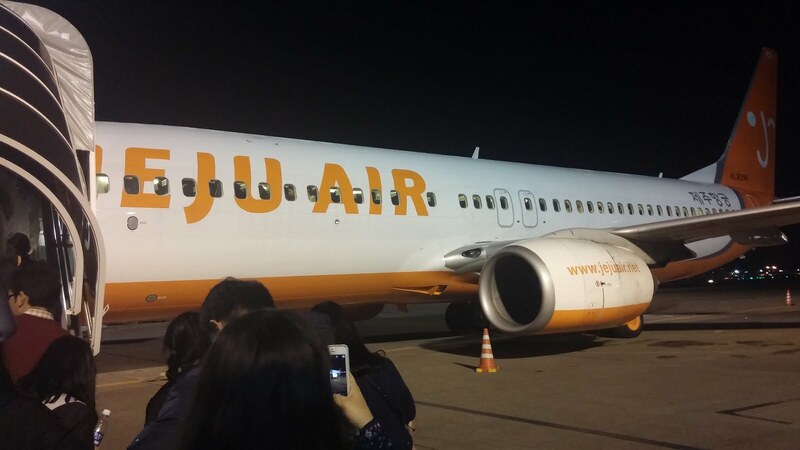 Everyone hopped on and we got driven to Korea over the new bridge out to our plane which was located at some remote corner of the airport. Right up next to the enclosing wire fence in fact. I guess that explains the strict boarding cut-off time! 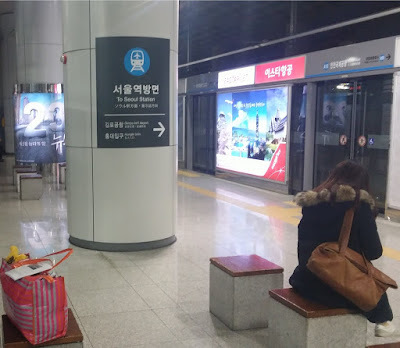 When booking our flights we had noticed that the trip to Korea took about 30 minutes longer than the journey back. I had thought that this must have been due to headwinds or something but actually it was because we literally had a 30 minute taxi to the runway! We had a really slow tour around almost the entire perimeter of Narita Airport! Inside the cabin was very old, but it was functional and we arrived safely into Incheon airport a few hours later. Upon arrival we went through immigration, customs and then walked through the airport looking for the train station. Actually, before that I used an ATM to get some money out. We probably should've waited until we found a Citibank ATM though as I got hit with a rather large ATM fee. Anyway, we managed to arrive and buy our ticket just after the next train left, which meant we had to wait a while on the platform. Drat! Our hotel was the Skypark Myeondong III and we managed to arrive a little before midnight. The hotel was clean and functional and similar to Japanese businesses hotels. Tomorrow we'll be looking around Seoul city!